I was answering some press questions the other day about lightening the mood of an interior and the journalist in question wanted to know what percentage of items should be fun, a little crazy, tongue in cheek. Although there are no set rules I would say 10-15% percent of items should have an element of levity and whimsy. A little quirk lightens the mood,breaks up the formality of a space. If a room is merely playful though it appears silly, if its too chic its dry, uptight and off putting. So its a fine balancing act which is why I am a big fan off adding animal inspired products to my interiors. They temper a room with just the right note if it happens to be too formal or too decorative. A zeebra rug floating on the floor in a living room, a papier mache elephant plonked on a heap of books on a shelf, a couple of owl candles on the table that kind of thing. Of course many things lighten the mood ofÂ a space – art particularly. I came across RJ Thornburg’s pad – a formal pig farm no less which he has contemporised with modern, retro and a casual vibe. Art makes the hugest difference if you’re thinking of adding an element of levity- it can set a different tone break up the formality no end. Enough yabbering images from the pig farm to prove my point. Photos Keith Scott Morton. Hallways are such transitional areas so I am a big fan of making them as interesting as possibly so people get to stop and linger. The artwork sets an interesting tone, creates a visual punch and counter balances beautifully the rather traditional sculpture. 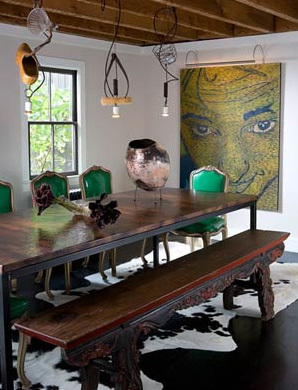 A fabulous way of breaking up the formality of a dining room is to add fun art and a cool rug. It shouts sense of fun without being silly. The tables and chairs are formal but lightened by these interesting elements. 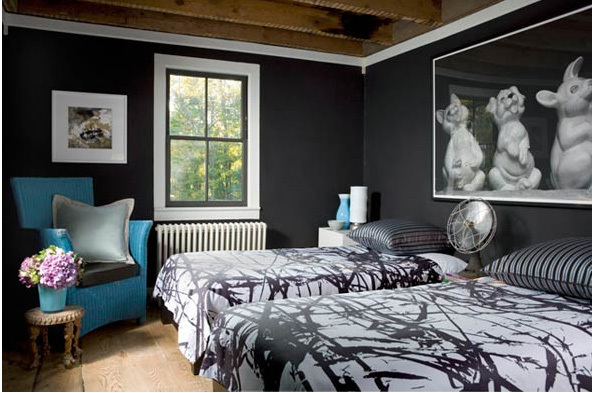 Dark sophisticated walls are made playful by the fun artwork and playful bedding. Its formal but not overtly so. Life is so serious so adding some unpredictability is a must – for me at least.